Costco has several unique strengths that is helping it to put Amazon in its place. Sorry Jeff Bezos. In the wake of Toys 'R' Us' sad liquidation, spurred in part by the growing dominance of Amazon (AMZN - Get Report) in toys, it's helpful to look at one retailer that is actually thriving in the age of Bezos. That is none other than bulk mustard selling king Costco Wholesale (COST - Get Report) . Costco shares have risen a heady 77% over the past five years, relatively in line to the S&P 500. During that same span, Walmart and Target shares have gained about 22% and 6%, respectively. For the 24-weeks ended Feb. 18, Costco's U.S. same-store sales increased 8.6%. Membership fees were up 11%. 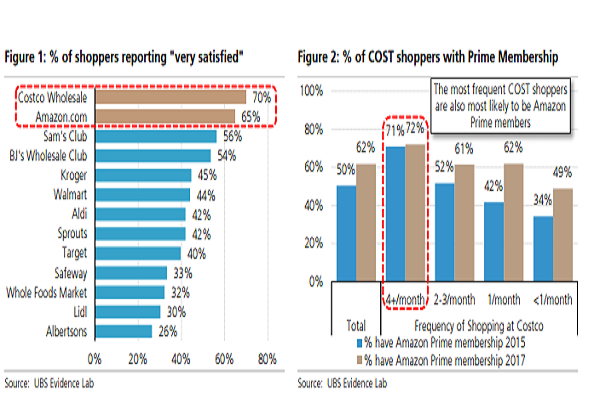 New research out of UBS nicely captures how Costco is managing to beat back Amazon. The wholesale king is seeing higher customer satisfaction scores overall, notes UBS. Hat tip to Costco's well-paid store associates. Customer service has fast become a key differentiator in retail, reminds UBS retail analyst Michael Lasser. 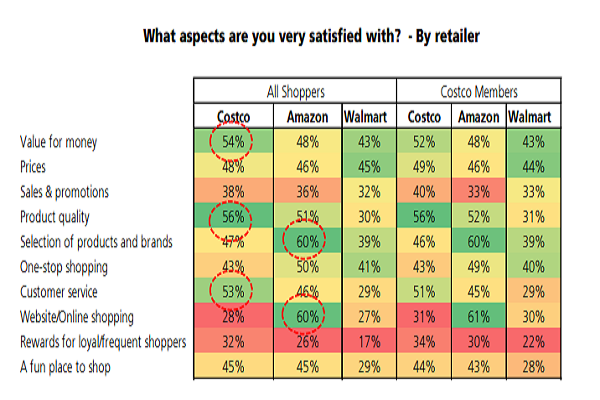 "Our survey highlights that 70% of Costco shoppers are very satisfied with the retailer (compared to 66% in our last survey) -- this is followed by Amazon (65%) and Sam's Club (56%)." 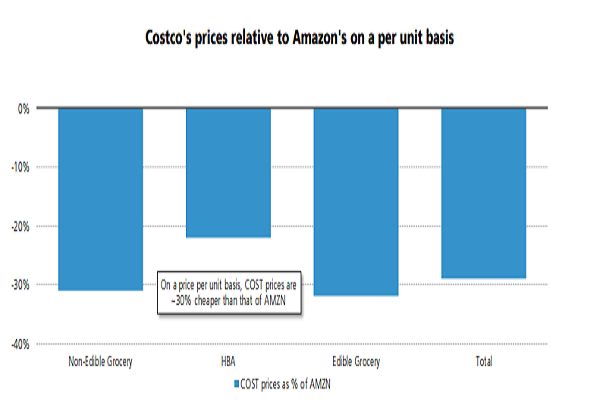 Believe it or not, consumers think Costco has better prices in many categories than the notorious cutthroat Amazon. While Costco has work to do with its online shopping experience, the products it does get to consumers from the site or in stores are viewed as higher quality than Action Alerts Plus holding Amazon.